3,074 ± sq. ft. home with 4 bedrooms, 4.5 baths, 2nd floor bonus room, and attached 2-car garage. 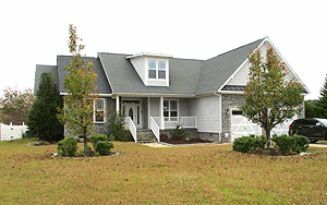 Located on a fenced lot in the community of Brownstone Farm. SINGLE FAMILY HOME Per the stated Terms of Sale, this property is sold AS IS WHERE IS. 3,074 ± sq. ft. home with 4 bedrooms, 4.1 baths, kitchen with breakfast nook, living room, dining room, family room with fireplace, laundry, 2nd floor bonus room, enclosed porch, deck, and attached 2-car garage. The fenced property is located in the Brownstone Farm community. Raeford is approximately 15 miles outside of Fayettville, NC. Note: HOA documents will be posted soon.